Yep, you know what I have on the brain. Ever since we set the date, I have been thinking non stop about us getting married. Friday, we got a ring sizing kit in the mail. So what did we do? 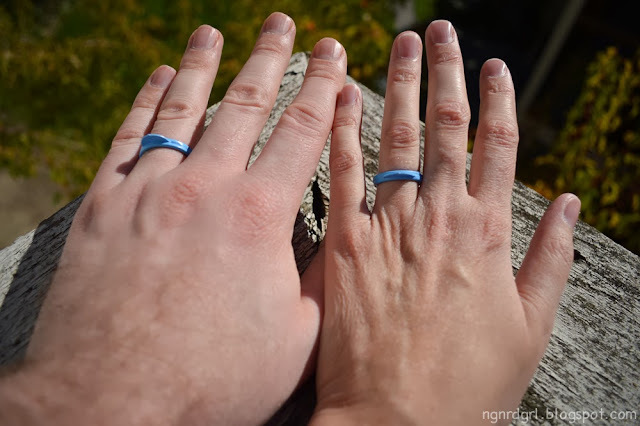 We popped our ring sizes out and have been wearing them all weekend, just to ensure we get the right size. We were totally geeks and wore our ring sizing tools all weekend to ensure we knew which size we wanted. Why are we ordering bands so soon? Well, we picked out my engagement ring last weekend. It comes with a matching wedding band, so we decided to pick out his band too. I'll share with you more about our rings later. Today, I'm going to go over how I made our save the date image in PicMonkey. You could skip this step and go straight to PicMonkey and choose one of their swatches, but their swatches are typically seasonal (right now they have some spoooooky swatches!). 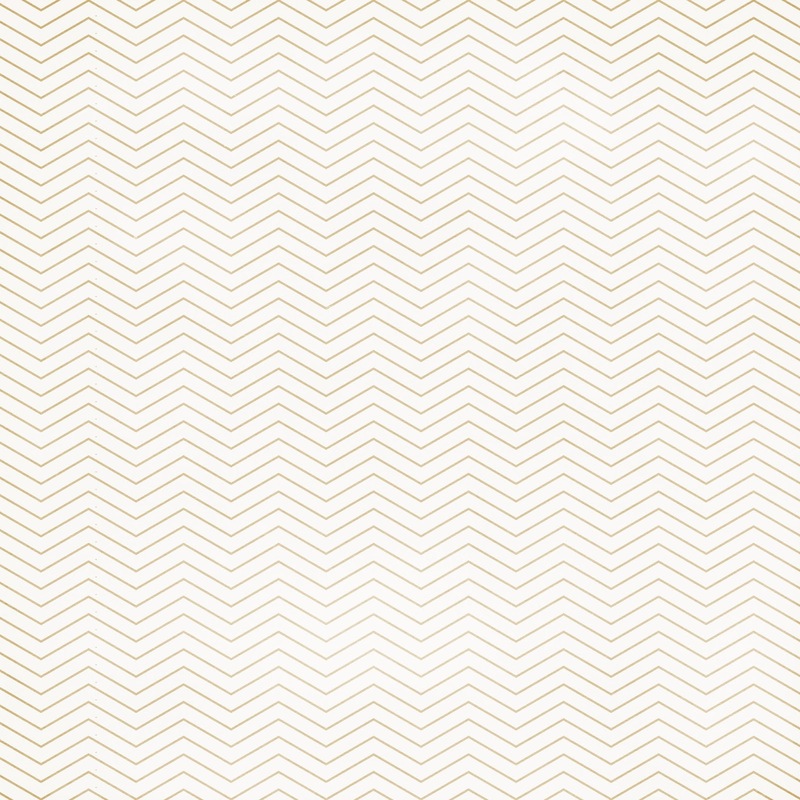 I used Pixel Scrapper to find free digital scrapbooking elements and papers. Sign up for an account and they give you 1 kit download, 25 download credits and 5 download credits per day. You can then download free digital papers, accents, letters, etc. These are super useful for creating your own graphics for invites or blogs. This is how I made my current header (see What's in a Name? for more details). 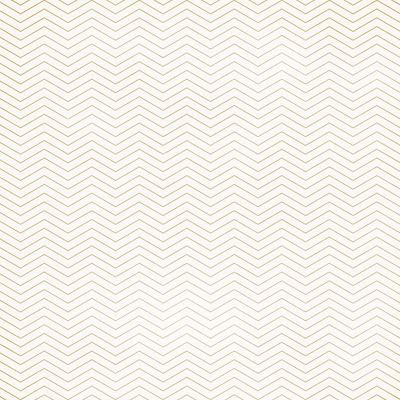 I chose the Chevron 01 - White & Tan from the Superlatives Papers Kit for my background. Head over to PicMonkey and click the button "Create a collage." Click on "Create a collage" button circled. Set the dimensions to the size you want (circled in red at the bottom of the picture below). I was making mine for a digital save the date image for our wedding website/blog, so I made mine 1000 x 1000 pixels. If you are going to use yours for cards, I suggest finding the dimensions you need first. Use this calculator to convert from inches to pixels. Click on two of the X's to delete two of the photo slots. You will only want one slot. Also, set the spacing between photos to 0 by clicking on the paint pallette button, bottom one on the left hand side, and using the slider circled below. Set dimensions (circled on bottom). Set spacing to 0 (circled on left). Next, click on the photo button, top one on the left panel. Click on "Open photos" button to open your desired background as a photo. Drag and drop your background into the photo panel. It should look like this now. Open your background as a photo and drag and drop it into the collage. Next click the "edit" button. If satisfied, click "Edit" button at the top (highlighted in green in the above picture). 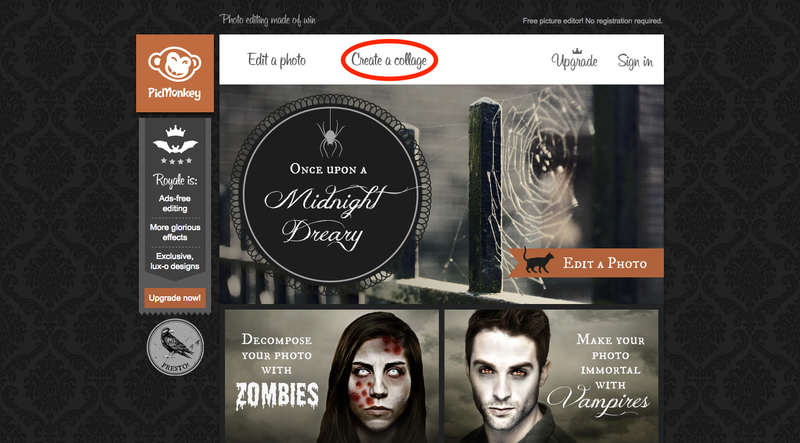 Once you click edit, you cannot go back to the collage settings. After clicking the "Edit" button, it is time to add your text! Click the "Tt" button on the left panel and click the "Add Text" button. In the picture below, I added all my text at once when in reality (the first time I made it) I did it in steps. 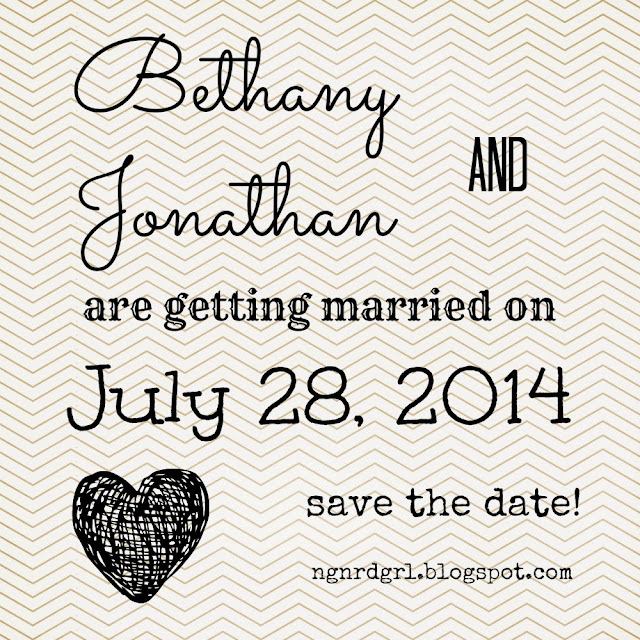 "Bethany /p Jonathan" (/p=paragraph) is one block of text, "And," "are getting married on," "July 28, 2014" and "Save the date" are all separate blocks of text. Now it's time to play with fonts, sizes and locations. Set your fonts, size and locations. I wanted to make mine look like subway art. I don't think I was too successful in mimicking this style, but I do like how it ended up. I think if I had made my font larger, I could have mimicked this better. The fonts I used are the following: Sacramento for our names; Tall Dark and Handsome for "and;" Rye for "are getting married on;" Unkempt for the date; and Special Elite for the "save the date" and blog address. Here is how it turned out with my fonts. Get your fonts all set up. Grab some embellishments from Pixel Scrapper or use the overlays native to PicMonkey. Either way, you want to click on the butterfly button on the left panel to add an embellishment/overlay. Click on "Your own" to upload an embellishment you downloaded from elsewhere. I choose to add a doodly heart native to PicMonkey. It inserts in red so I changed it to black in the overlay settings panel. Lastly, you will want to resize, rearrange and make sure everything looks perfect. Once you close this window, you will not be able to make any edits, so make sure you are happy with it. Save it and share it! 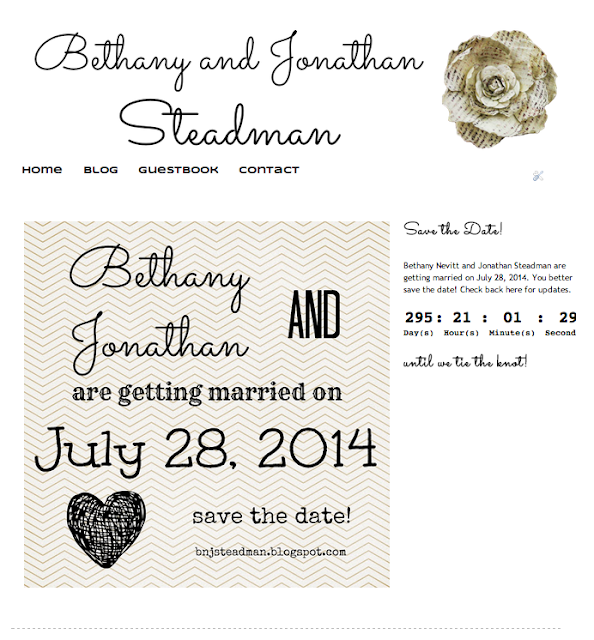 I added the web address for our wedding blog. My intent is to email this out to our guests and direct them to our blog for more information. 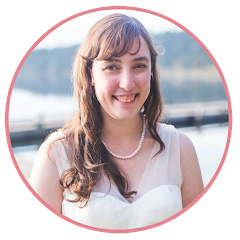 Want a sneak peek of how the wedding blog is turning out? Screen shot of the wedding website so far. I am really liking how it is turning out!!! The embellishment in the header is also from Pixel Scrapper and the header was made in PicMonkey. I have lots of plans for our site. For now it is completely geared towards our wedding and it will provide guests with all the information they need. Afterwards, it will become our family blog. If I was going to mail these out, I would look into making a postcard to save money on envelopes. Shutterfly has some card options that are as cheap as $0.40 each. They also have some great ideas for save the date cards. Have you have written your own blog post or series about wedding planning or decor? Or have a great resource tip? What do you think of my save the date graphic? Isn't my wedding website starting to look good? Disclaimer: None of the links above are affiliate links and I have no ties to any of the companies listed. All opinions are my own. I was not compensated in any shape or form. Fabulous! I use pixlr about 50% of the time to edit photos, but the other 50% of the time, I'm on pix monkey. It really is superior for making graphic...and I love the route you took with your Save the Dates...the unique fonts give it that Subway Art vibe...and I love the scribbly heart! Also, way to be smart and order a ring-sizing kit. We didn't do that - - I think we did the paper print-out method, but it wasn't as effective and we had to get my ring sized down a half. Sadly, now, I probably could have used that extra half size because it's rather snug! So excited for you, friend! And thanks for including my series in your linky again. You're the sweetest. Thank you, friend! It has been a crazy week. I told my boss and mentor at work about our upcoming wedding. They were gushing all over it. Of course, everyone wants to provide tips. We had dinner with my parents last night. We had been trying to get things arranged with them so we could tell them in person. We had things planned, then my mom got sick so I ended up spilling the beans to her via text message. She couldn't contain herself, so she figured out a date for dinner so I could tell her and my dad officially. We did that last night. We are planning on driving out to a venue today to take a look at it. We want to reserve the date as soon as it is available online (a couple weeks from now). I haven't been able to stop thinking about our wedding... It seriously kept me up all night! Gosh! We still have over 280 days... How am I going to be the night before! lol! How exciting! LOVE your save the date, and the wedding website looks awesome!! 280 days will fly by and it will be here before you know it! 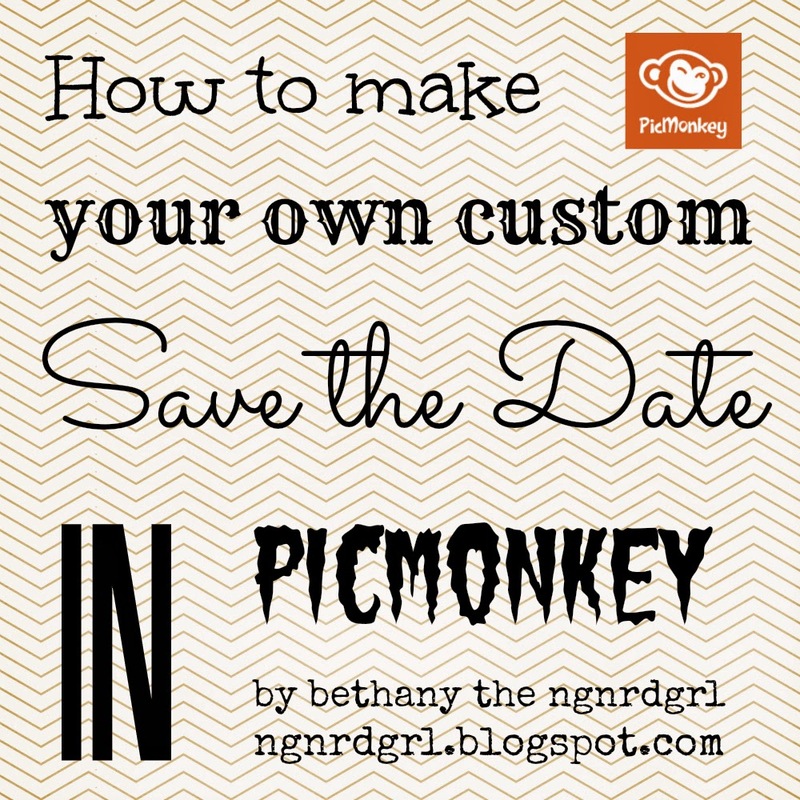 Thanks so much for the picmonkey tips, friend! Hope you guys are doing well! Now there has been several services and products together with adequate cameras and also the mobile phone market additionally has lots of handsets using quite large res camera mobiles with great pixel density that is calculated through PPI Calculator. Certainly one of these would be now your Samsung G800. This is really an milestone hand-set with regards to the way it can shoot nice and higher pixel in addition to clear images with all the minimum quantity of time. Thus the system includes a 5 mega pixel pixels digital camera that gets got the skill to shoot images with a resolution of 2560 x 1920 pixels.To calculate dpi of screen or screen density also the pixel per inch you can use this PPI Check Online,it shows the instant results.